"Just in time for the summer barbeque season! 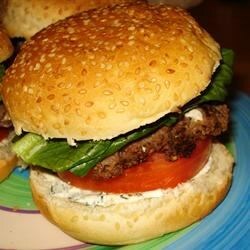 These juicy burgers are sure to be a crowd pleaser at those summer cookouts!" GREAT TWIST ON THE BURGER! A few notes: Use 80% Lean ground beef. Onion and garlic need not be pre cooked before adding to meat mixture. A must try! This was good. Making sure that the burger is cooked all the way is the hard part. Fabulous recipe "as is". We have also made it with ground lamb in the place of ground pork. These were fantastic. We had a little trouble keeping the burgers together on the grill, but they tasted great.